Weight: 90 kg - With adapter plate, 1 tool and tubes Working 30 days warranty in Italy Price not negotiable but including shipping in all continental europe - Hydraulic hammer in 2007. Weight: 160 kg - for miniexcavators 2 - 3,7 ton - Hydraulic hammer in 2008. Weight: 360 kg - For midi-excavators 6 - 9 ton and backhoes - Hydraulic hammer in 2009. Weight: 100 kg - New equipment, ready for use. - Hydraulic hammer in 2019. Weight: 250 kg - New equipment, ready for use. - Hydraulic hammer in 2019. Weight: 80 kg - For 1,5 ton miniexcavators - Hydraulic hammer in 2016. Weight: 240 kg - For miniexcavators 2,5 - 4,5 ton - Hydraulic hammer in 2012. Weight: 75 kg - General very good condition used equipment, ready for use. - Hydraulic hammer in 2010. Ask for price - Weight: 120 kg - Excellent condition used equipment, ready for use. - Hydraulic hammer in 2007. Weight: 100 kg - Used equipment ready for use. - Hydraulic hammer in 2019. Weight: 145 kg - Used equipment ready for use. - Hydraulic hammer in 2019. Weight: 200 kg - Used equipment ready for use. - Hydraulic hammer in 2019. Weight: 250 kg - Used equipment ready for use. - Hydraulic hammer in 2019. Weight: 300 kg - Used equipment ready for use. - Hydraulic hammer in 2019. Weight: 350 kg - Used equipment ready for use. - Hydraulic hammer in 2019. Weight: 430 kg - Used equipment ready for use. - Hydraulic hammer in 2019. Weight: 70 kg - Used equipment ready for use. - Hydraulic hammer in 2019. Ask for price - Weight: 300 kg - General good condition used equipment, ready for use. - Hydraulic hammer in 2009. Ask for price - Weight: 120 kg - new breaker - Hydraulic hammer in 2017. Weight: 250 kg - General very good condition used equipment, ready for use. - Hydraulic hammer in 2008. Weight: 150 kg - General very good condition used equipment, ready for use. - Hydraulic hammer in 2008. Weight: 150 kg - General very good condition used equipment, ready for use. - Hydraulic hammer in 2006. Ask for price - Weight: 110 kg - New equipment, ready for use. - Hydraulic hammer in 2004. Weight: 160 kg - General very good condition used equipment, ready for use. - Hydraulic hammer in 2010. Weight: 160 kg - General very good condition used equipment, ready for use. - Hydraulic hammer in 2008. Weight: 280 kg - General very good condition used equipment, ready for use. - Hydraulic hammer in 2010. 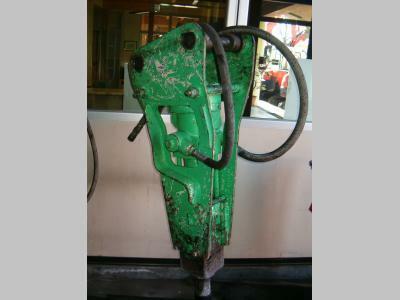 Weight: 450 kg - For midiexcavators 6 - 9 ton - Hydraulic hammer in 1997. Ask for price - Weight: 90 kg - General very good condition used equipment, ready for use. - Hydraulic hammer in 2000. Weight: 140 kg - General very good condition used equipment, ready for use. - Hydraulic hammer in 2004. Weight: 130 kg - General very good condition used equipment, ready for use. - Hydraulic hammer in 2005. Ask for price - Weight: 190 kg - General very good condition used equipment, ready for use. - Hydraulic hammer in 2015. Weight: 300 kg - General very good condition used equipment, ready for use. - Hydraulic hammer in 2015. Ask for price - Weight: 71 kg - With tool and docs For 0.8 - 1.8 miniexcavators - Hydraulic hammer in 2018. Weight: 220 kg - General good condition used equipment, ready for use. - Hydraulic hammer in 1999. Ask for price - Weight: 260 kg - General very good condition used equipment, ready for use. - Hydraulic hammer in 2006. Weight: 460 kg - General very good condition used equipment, ready for use. - Hydraulic hammer in 2005. Weight: 400 kg - Hydraulic hammer Socomec DMS 400, year 2015, weight 400 kg, hydraulic system max delivery 70-95 lt/min, hydraulic system pressure 120 bar, previously installed on excavator Komatsu PC 80 MR-3. - Hydra...continue.